Weatherstock is an event on a truly epic scale and as such it attracts some of the finest and most accomplished musicians to be found anywhere in Middle Earth. It is held once a year during a flurry of publicity co-ordinated and organised by the respected Lonely Mountain Band. 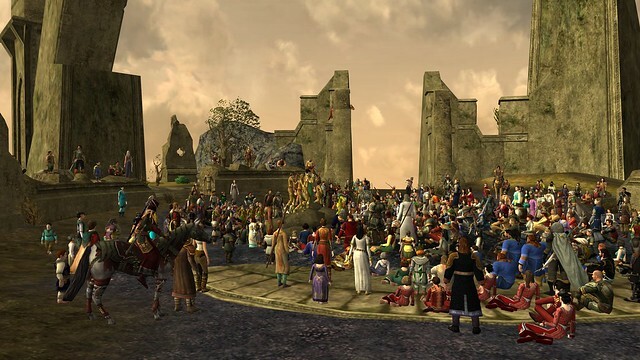 A number of events lead up to Weatherstock, including a series of smaller concerts at various locations giving each band the chance to impress and gather new followers. It was the first time that the Songburrow Strollers had attended Weatherstock and they were to be in for a big surprise. Nothing in their wildest imagination could have prepared them for the spectacle that greeted them on the summit. The initial welcome had been both warm and cordial with the organisers the Lonely Mountain Band providing last minute guidance and assistance. The Strollers had played to a large audience before, most notably during their Bree-land concert at Buckland, but this was to be a far greater challenge. From the moment the Strollers set foot outside the Forsaken Inn it was clear that this was to be a magnificent gathering. So many folk had assembled amid a good natured air of general merriment which culminated in an impromptu performance by their friends in The Chosen Few. On the summit things were decidedly busier with scarcely a space to stand. For this years competition the Strollers had prepared a special composition entitled The Grand Weatherstock Song as well as a selection of Shire favourites with which to woo the crowd. Before the night was out the Strollers, now tired and more than a little sleepy would carry away the much coveted Lonely Mountain Cup. Hurrah! Weatherstock, Weatherstock, lots of people there. Weatherstock, Weatherstock, flowers in their hair. We have come here from the Shire. Over hills and through the mire. We're the Strollers, dance with us tonight. With their Bandmaster Simbo Rumblebelly called away to the Southfarthing on short notice the Strollers sought assistance in the shape of Miss Lully. Stepping into the Bandmaster's shoes is never an easy task especially while standing on a stone wall outside the most prominent of locations - the Town Hall in Bree. No concert would be complete without the requisite party. Finding themselves in the somewhat unfamiliar environs of Bree the Songburrow Strollers soon gathered a following of locals and Shire folk to the only noteworthy inn in town - The Prancing Pony. Undaunted by the unwarranted looks of the patrons the band soon found themselves the centre of attention. In front of the great hearth a space was cleared solely for their use. A little piece of the Shire had indeed been brought to Bree.